I've always had a soft spot for this church. Back in the 1990s when I first started exploring the churches of East Anglia, this was just about the only church which was kept open in an area of locked ones. It is still open today, and so now are many of the churches around it, a mark of how attitudes have changed towards pilgrims and strangers in the last twenty years or so. Nowadays, when I visit an area where the churches are mostly kept locked, the Tendring Peninsula or the Lowestoft area for instance, I think of Flempton and know that enlightenment might well reach these areas too one day. It was the Saturday of the beautiful Spring Bank Holiday 2013. The weekend had been preceded by a week of heavy rain, and indeed there was more rain to come in the following week, but for now Suffolk looked green and lovely in the sunshine. St Catherine's churchyard was a delight, the high grass full of spring flowers, the headstones peeping up through them. It felt like God's Acre. I hadn't been back to Flempton for fifteen years, and on the previous entry for St Catherine on the site I had failed to explain quite how lovely this church is inside. This is largely a result of one of the best collections of early 20th Century glass in this part of Suffolk. Some of it is beautiful, some of it curious. Curosity consists of the great west window, partly a memorial to a parishioner killed in the Boer War, but largely a tribute to Queen Victoria, after her death in 1901. By Ward & Hughes, it depicts the young queen kneeling before Christ who is about to crown her, while Faith, Hope, Charity and Compassion look on. She has taken off her earthly crown, which now lies at her knees, to receive the crown of Heaven. Facing each other across the nave are two very good windows of the early-to-mid century. On the south side, a window by GER Smith depicts St John the Evangelist flanked by St Francis and St Christopher. Opposite is a fine depiction of St Catherine and St Gertrude. It is unsigned, but I wondered if it might be by FC Eden. Up in the chancel, the glass veers back towards curiosity again. On the south side of the chancel there is a low side window, and the glass in it depicts Christ healing lepers. This arose from a mistaken 19th Century belief that low side windows were actually squints for those suffering from leprosy to watch the Mass through. You can see something similar across the county at Barsham. The east window is a powerfully drawn Crucifixion by Clayton & Bell. It remembers John Lysaght, and he and his wife appear to be depicted bottom right and left, kneeling. The figure of Mary Magdalene, shown grasping the cross in grief, is particularly moving. Amongst all this excitement there are a number of quieter medieval survivals. The Decorated double piscina is lovely, and the plainness of the contemporary font is seemly. The best 14th Century survival is actually visible from outside - this is the tracery on the door, still surviving despite the almost complete rebuilding of the church a century later, and another rebuilding after the tower collapsed in the 18th Century. And that century brought the royal arms, signed by the painter Edward Boynter of Bury. I sat outside in the verdant churchyard, a good place to eat a sandwich and drink a bottle of water. The road along the south side of the churchyard is the Bury to Mildenhall road, and the Flempton to West Stow road with the village pub runs along the west and north sides, but this is a quiet place for all that, the grassy graveyard seeming to swallow sound. The parish is a joint one with the nearby village of Hengrave, the round-towered church there becoming a mausoleum and private chapel in the years after the Reformation for the Catholic family who lived in the Hall. The Hall later became a school, and then after the Second World War a convent. Hengrave church sits barely a mile to the east of Flempton, and is one of the most interesting small churches in Suffolk. It was easy to visit every day when the Hall was in the care of the nuns, but the Hall was sold some ten years ago, and the church is now a zealously guarded private venue for posh weddings. The Hall website informs you that they can hold Roman Catholic, Methodist, Baptist or United Reform marriages. 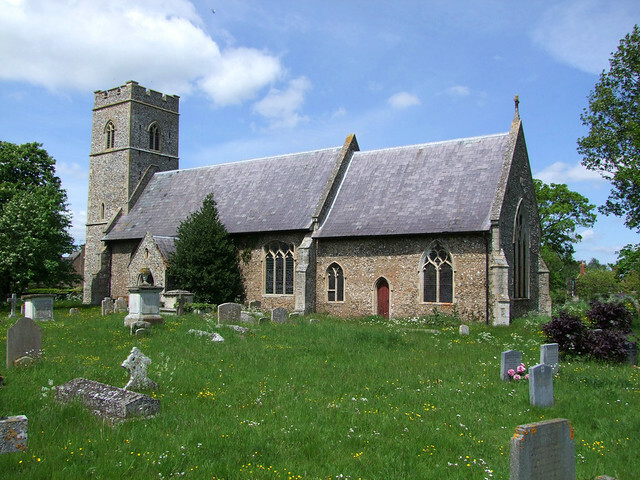 However, as it has not been an Anglican parish church for almost five centuries, they cannot, of course, use it for Church of England ceremonies.